It wasn't until I learned how to use this cleanser properly that I came to realize its invaluable role in making my skin look better. 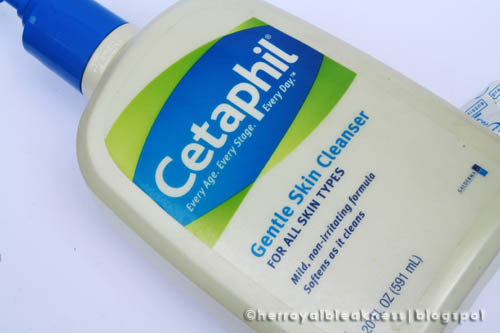 I'm a bit embarrassed to admit that I used to wet my face prior to applying the Cetaphil Gentle Skin cleanser on my face. Have you committed the same mistake? Mild, non-irritating, softens as it cleans! I saw that the cleanser performed better when used properly, slathered on a non-wet face. As a makeup remover, I rinse via tissuing it off (I repeat the process 2-3x for heavy makeup); as a regular cleanser, I resort to water for rinsing. And I saw an enormous amount of difference in my skin's texture and overall look! Pros: Cetaphil Gentle skin cleanser is an awesome way to restore balance to the skin. It makes it more supple and healthy-looking. I love that the cleanser is clear and unscented and that the huge bottle comes with a pump. It also comes in different sizes to fit your budget but the 591mL bottle gives the biggest bang for the buck. Our local Mercury drugstores carry it in 250mL and 473mL bottles at 275php and 540php. I saw 60mL trial-sizes too in beauty sections of department stores and is sold at ~90php. If you are fond of cleansing oils, check out my take on the Shu Uemura High Performance Balancing Oil in Fresh (Pink) and Kanebo Freshel Cleansing Oil. I've also done a Shu Uemura vs Kanebo Cleansing Oil Compounded Review. The Cetaphil cleanser is my makeup remover (use generously), cleanser and my solvent for prednisone in my DIY treatment for contact dermatitis. It's definitely an inexpensive 3-in-1 product for me! Cons: the parabens on the ingredients list is a letdown. Propyl-, Butyl- and Methyl- to be exact. Also, the 591mL size is not available locally. good to know this works for you great! Great point about using products as directed! :) A lot of times we forgo actually reading the instructions. I've made this mistake too...hehe. 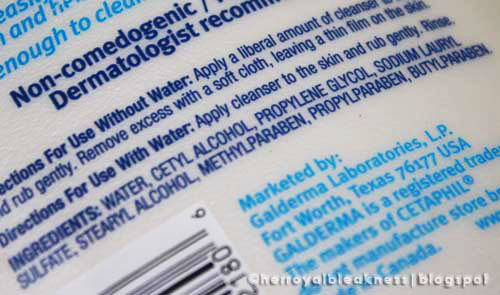 Although Cetaphil did not work for me, I agree with going the soap-free route. I love Purpose gentle cleansing wash b/c of this. I got pretty ok with parabens now. Read several cosmetic chemist blogs and articles that parabens remain to be the gold standard in preserving cosmetic products. I'm glad you're liking this one, too! Isn't it perfect for sensitive skin? thanks for sharing! preggy women just have to look for an alternative in this case! hi, been reading your blog for a few weeks now. this is my first post. i also wet my face prior to applying cetaphil kaya siguro hindi nacclean mabuti face ko. i can still see dirt on the cotton when i apply toner. will try this product again. is cetaphil also good in controlling pimples? I'm def buying this cleanser! Great review :) I love gentle cleansers as well, and especially now that we're transitioning into cooler weather. I also use cetaphil for cleansing as well as a makeup remover. A bit pricey though. WOAH.Didn't know that there is such a right way. I used this one but I had breakouts. Wonder if I should try again or just stick with Neutrogena?